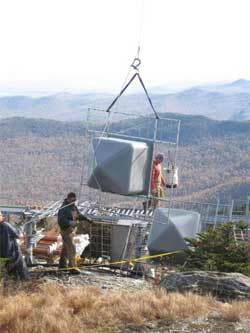 When Vermont Public Radio awarded Shively Labs a contract for a new antenna and combiner in April 1998 to broadcast WVPS from Mt. Mansfield, the event marked completion of over a year’s worth of preliminary engineering and planning. 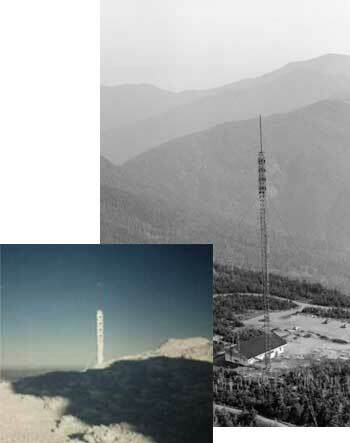 The antenna was designed to replace WVPS’s 10-year-old Shively 6810 sidemount antenna and WEZF’s 18-year-old Shively panel antenna with a new, combined antenna. Mt. 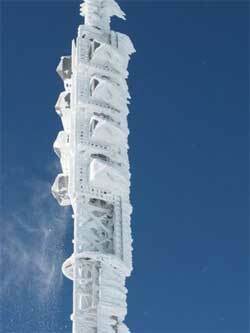 Mansfield is one of North America’s most challenging broadcast sites, with extreme weather rivaling that of nearby Mt. Washington in New Hampshire. The mountain is home to a very rare and fragile arctic tundra ecosystem that is popular with hikers and skiers, making downward radiation issues and aesthetics as important as coverage patterns and survivability in the design of the antenna. 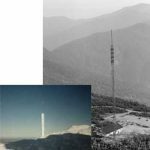 Construction of the antenna and combiner was halted almost as soon as it was begun when it was learned that regulatory issues had arisen that would delay installation beyond the notoriously short Mt. Mansfield construction season. These regulatory hurdles would not be completely cleared for nearly 7 years. 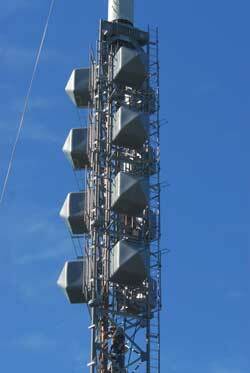 In 2005, work finally began on a new tower to hold the WVPS/WEZF FM panel antenna along with a master UHF TV antenna. Construction of the tower and antenna installations began in August of 2006. The FM panel antenna is a Model 6014-4/3R-.9SS-SPL broadband (88-108 MHz) panel antenna. The antenna consists of 4 bays of 3 radiators per bay. Interbay spacing is .9 wavelength to suppress downward radiation. HD Radio™ implementation, not anticipated in the 1998 design, is accomplished by means of dual, parallel feed systems designed to combine analog and digital signals in the antenna radiators. 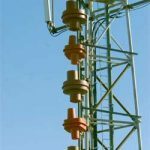 The feeds are equally sized, allowing for future expansion and redundancy as well as a check valve system that ensures that if pressurization is lost in one transmission line or feed system, each antenna radiator remains pressurized through the other feed. Through every step of the design, the unique environment of Mt. Mansfield was incorporated into the design and fabrication of the antenna system. One panel face of the antenna incorporates a climbing ladder necessitated by the very crowded interior of the antenna. 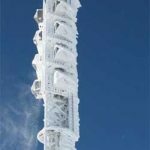 Power dividers and critical feed system components are located below the antenna inside specially designed grating and skirting to protect them from falling ice. The Mt. Mansfield antenna also uses radomes designed especially for this site. Radomes are not normally used on the broadband Model 6014, but were employed here to increase protection from falling ice. While the radomes of all previous Shively Mt. 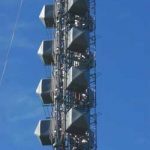 Mansfield antennas have been brown, a new gray pigment was formulated and tested to help meet increasingly stringent aesthetic requirements. 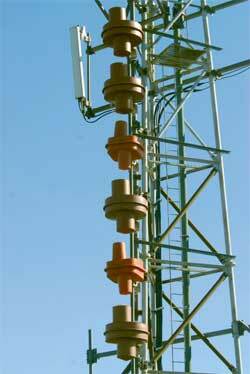 WVPS began full time broadcasting of its analog signal from the new antenna on October 27, 2006. With the installation of new STL dishes in the spring of 2007 WVPS is now broadcasting HD1, VPR Classical on HD2, and BBC World Service on HD3. WVPR, with a Shively Model 6014 atop Mt. 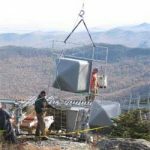 Ascutney, was the first station to broadcast digital radio in Vermont and the WVPS signal promises to significantly increase the service not only across the Green Mountain State, but also well into New York, New Hampshire, and Quebec. WEZF is scheduled to begin operation from the new antenna sometime in 2009, just in time to retire the old Shively panel before its 30th birthday. For more information: VPR Web site report with audio from a news report synopsizing the project, photos and periodic updates from their director of engineering Rich Parker. Photos are courtesy of Vermont Public Radio and Rich Parker. HD Radio™ is a trademark of iBiquity Corporation.